Les Isles Britanniques qui comprennent les Royaumes d'Angleterre, d'Ecosse et d'Irlande. 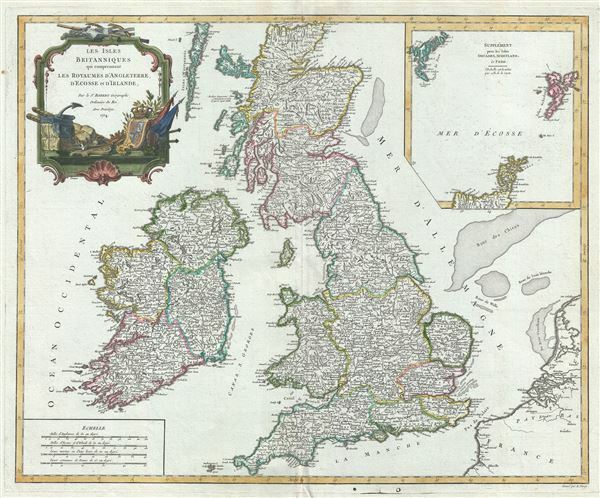 This is a beautiful 1754 map of the British Isles by Robert de Vaugondy. Vaugondy's map covers all of England, Wales, Scotland and Ireland. Several important towns, cities, roads, rivers, lakes and other topographical features are noted, with elevation beautifully rendered. This map also offers splendid detail throughout with respect to undersea shoals and reefs in the surrounding waters. An inset of the Shetland, Orkney and Faroe Islands is included in the top right quadrant. A highly decorative title cartouche by Groux appears in the top left quadrant. Drawn by Robert de Vaugondy in 1754 and published in the 1757 issue of his Atlas Universal. The Atlas Universal was one of the first atlases based upon actual surveys. Therefore, this map is highly accurate (for the period) and has most contemporary town names correct, though historic names are, in many cases, incorrect or omitted. Vaugondy, R., Atlas Universel (Paris) 1757. Very good. Some wear along original centerfold. Original platemark visible. Minor creasing and spotting, with some offsetting. Rumsey 3353.015. Pedley, Mary Sponberg Belle et Utile: The Work of the Robert de Vaugondy Family of Mapmakers, 43, State 3.